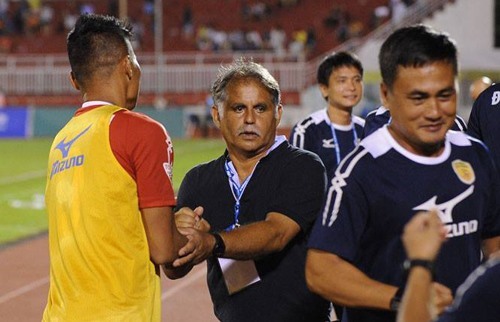 HÀ NỘI — With just two matches left this season, V.League 1’s team HCM City have said goodbye to French coach Alain Fiard. The decision caught many fans by surprise, as the 58-year-old coach helped the team stay in the league. Moreover, Fiard’s contract with the team will be valid until the end of this month. “HCM City and Coach Fiard won’t work together in the coming time. In the two remaining matches of the league, Lư Đình Tuấn will coach the team,” Lê Công Vinh, acting chairman of HCM City confirmed.. Lư Đình Tuấn previously served as Fiard’s assistant. This is the first year HCM City have played in the national premiere league. The team now ranks 11th out of 14 teams with 25 points. Former national striker Vinh explained about the 0-4 loss against Hà Nội in round 24 contributed to the decision to stop working with Fiard. Fiard didn’t inspire his players to try their best, contributing to the heavy loss. “HCM City completed their target of staying in the league and the event will fend in just two more rounds, but the team can’t simply drop off in the event’s remaining time. The coach should be a person who can make his players play with all their hearts. My team have to play characteristically. They must fight in every game,” Vinh added. Fiard was a coach and former player of the French Ligue 1, one of the world’s leading football leagues. Before coming to Việt Nam, Fiard worked as assistant coach at Auxerre FC. He was deputy head coach for Auxerre since 2011.